The Fate of the Furious (2017), the most action-heavy action movie I’ve seen since Mad Mad: Fury Road! MY CALL: If Michael Bay and Mad Max: Fury Road (2015) had a baby and then exposed it to Godzilla-levels of Marvel’s Gamma radiation, you’d get this action movie. I want to label this the most action-heavy action movie I’ve seen in years—it makes The Expendables movies feel slow and plotty. I had so much fun yelling and laughing at the screen! MORE MOVIES LIKE The Fate of the Furious: Mad Max: Fury Road (2015)—the only other recent film of remotely comparable levels of grand-scale action. Of course, there are also a lot of other Fast and Furious films. Personally, after the original (for the sake of historical franchise significance), I most strongly recommend Fast Five (2011; best story and best brawl), Fast and Furious 6 (2015; best technical fight scenes), and Furious 7 (2015; most action galore). For yet more Fast and Furious opinions be sure to check out our Podcast on Corona, Belgian Beer, BBQ and the Fast and Furious films, A Closer Look at the Corona Drinking in The Fast and The Furious Franchise, Ranking Fast and Furious 1-6 and Paul Walker’s 7 Best Fast and Furious Moments. This franchise has taken us across the globe. From Mexico (Fast and Furious), Tokyo (Tokyo Drift), Brazil (Fast Five), all over Europe (Fast and Furious 6), and even to the Middle East (Furious 7). Every film faces Dom’s crew against bigger villains with larger-scale plans speckling massive explosions and property damage across the globe. So, then, what can the franchise give us that we haven’t seen before, and that Dom’s crew hasn’t faced before? The answer is Dominic Toretto (Vin Diesel; The Last Witch Hunter, Guardians of the Galaxy, Riddick) himself! After being double-crossed by Dom, Hobbs (Dwayne Johnson; Pain and Gain, Ballers, G I Joe: Retaliation) is imprisoned in an “ultra-maximum security” for crimes he didn’t commit and his only salvation is to take down Dom and his new cyber-terrorist extraordinaire boss, Cipher (Charlize Theron; Prometheus, Mad Max: Fury Road, Snow White and the Huntsman). To do this, Hobbs is reluctantly forced to team up with fellow inmate and Furious 7’s villain Deckard Shaw (Jason Statham; The Expendables 1-3, Mechanic: Resurrection). The Rock is a physically tremendous person with a larger-than-life personality. Yet Statham’s Shaw is so cheeky and menacing, we aren’t entirely convinced Hobbs would “beat him like a Cherokee drum” as he had threatened. With the unreasonably insane resources of Mr. Nobody (Kurt Russell; The Hateful Eight, Bone Tomahawk, Furious 7) and Dom’s crew, they get to work. As usual, the crew brings back all of our favorite characters: Roman (Tyrese Gibson; Legion, Transformers 1-3, 2 Fast 2 Furious), Tej (Chris Ludacris Bridges; Gamer, 2 Fast 2 Furious, and rap performing artist), Elsa (Elsa Pataky; Snakes on a Plane, Fast Five), Letty (Michelle Rodriguez; Resident Evil, Machete Kills, Avatar), and hacker Ramsey (Nathalie Emmanuel; Game of Thrones, Maze Runner: The Scorch Trials, Fast and Furious 6). We also find cameos by Leo and Santos, Shaw’s brother (Luke Evans; Fast and Furious 6’s villain), and even Helen Mirren (Trumbo, RED 2)! Director F. Gary Gray (Straight Outta’ Compton, Law-Abiding Citizen) has taken a different approach than his predecessors. Among franchise parts 5-8, The Fate of the Furious has by far the most plot holes, unexplained developments, and completely unrealistic character appearances. We also don’t enjoy the fun aspect of seeing the crew plan their heists, rescue missions and escapes. Instead of each of these things (which I do miss), we basically get more, more and even yet MORE action scenes than any Fast and Furious film has ever contained stitched together by vague explanations and hand-waiving as Mr. Nobody says “watch this…” and “here you go [pointing to 89 500hp cars in a warehouse or the most powerful surveillance device in the world].” I’m not complaining, the action was earth-rattlingly awesome. So much flavor breathes insane hilarious exhilarating life into this movie. Shaw and Hobbs’ “I’m tougher than you” banter, the crazy combat prison break scene (packing some utterly brutal action for The Rock and Statham), Cuban street racing in reverse while on fire, the spectacular arctic ice-marauding submarine “chase” scene, a public service announcement regarding the dangers of self-driving cars, “Uncle” Shaw’s laughably awesome plane rescue-escape sequence, The Rock throwing a torpedo, perhaps more car crashes than I’ve ever seen in a single action movie, and so much more (truly there were so many action scenes) that I can’t even remember what else. My one complaint about the action was that the technical combat choreography clearly received less attention and the action camerawork was overly choppy (often too close-up and way too many cuts to see what’s going on). However, despite my whining, I still LOVED the fight scenes (e.g., the prison break, submarine chase and the plane escape scenes). As for the vehicular action scenes, WOW! If you thought the action was turned up to an “11” in parts 5-7, then now I guess we’re at a “12.” Sure, the plot was lacking and the storytelling was weak (much like comparing The Mechanic to Mechanic: Resurrection or The Transporter to its sequels), but the action scenes here were longer and more frequent than in parts 5-7 while being every bit as grand-scale and elaborate. These scenes could have been half as numerous and half as long and STILL this would have been a great action movie—but now it’s yet greater! We’re talking Michael Bay levels of destruction and explosions. It may have fallen well into the deep end of physics-defiant absurdity (even compared to this already absurd franchise populated by cars with Wolverine’s Adamantium shocks and struts)… but I somehow just don’t care. I loved it. I can’t wait to see this again. Beyond the fact that IMDB (Vin Diesel’s page) and movie media announcements confirm Fast and Furious films through a 9th and 10th installment (in 2019 and 2021; when Vin Diesel will be 54 years old), we end part 8 with the storyline wide open for a sequel for reasons that I obviously won’t spoil. 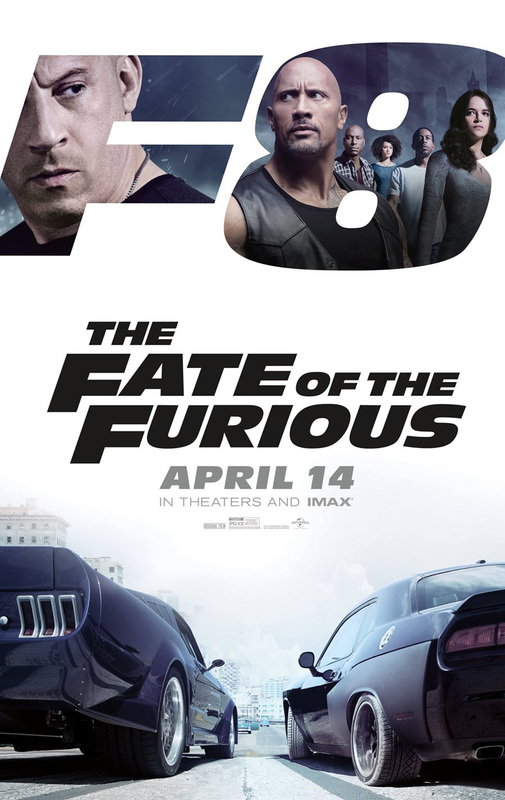 ← Fast & Furious 6 (2013), bigger cast, bigger biceps, bigger explosions and bigger stakes.